Welcome to this website of ACE Trains owned by Andries Grabowsky. "'We have noticed that Andries Grabowsky has posted an advertisement in the September 2018 edition of the HRCA Journal. As we represent Marcel Darphin's widow's interests in the UK we would point out the following. 'The advertisement is in contravention of the Trade Descriptions Act in that it does not describe the only part of the Darstaed business acquired was that relating to the tinplate line which at the time of purchase comprised the Marklin repro continental coaches. It did not include the finescale production which was retained by the Darphins. The buyer was allowed to use the Darstaed name only to the extent that the type face was restricted to 10mm in height and the letters TP should be displayed at the top right hand side. The 50 year credit claimed in the ad was not part of the purchase and only related to the original finescale line which was not part of the sale and preceded the original series by several decades. This was an attempt to mislead the general public via 'holding out' to be the owner of all the Darstaed historic output. In the event none of the Darstaed Marklin repro series were ever issued subsequent to the takeover of the tooling which is by now probably unusable in its original form. 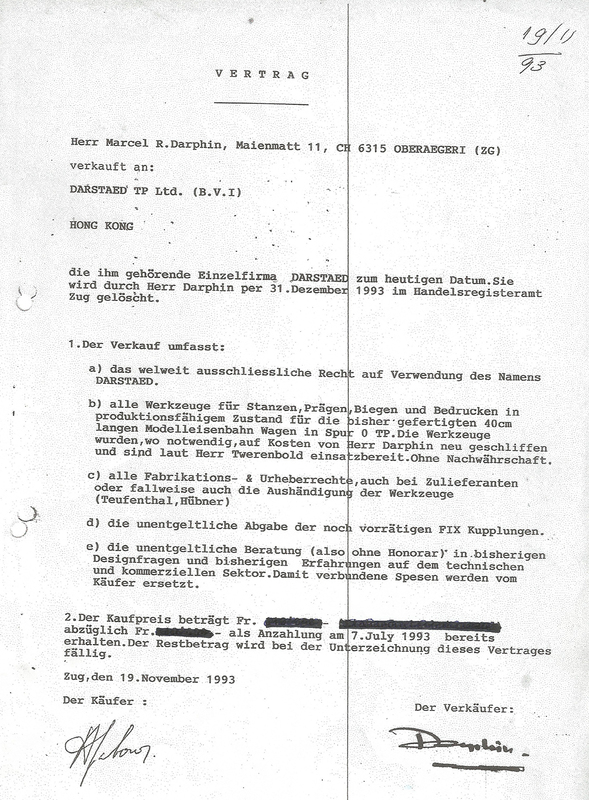 Facts speak for themselves and therefore I publish here the actual sales agreement between Mr. Darphin and myself dated the 19th of November 1993 for the sale of his Darstaed company to my Hong Kong company. There are two sections, the first dealing with the description of what was sold and the second section stipulating payment. The relevant part is the first section. c. All manufacturing rights and copyrights of all productions including those with suppliers like Teufenthal and Hübner (NB: 2-R fine scale not excluded AG). d. All Märklin couplings free of cost. e.Know-how and Goodwill free of cost. For the translation of any details you may use google translator “German-English”. 1. Mr. Levy states he represents Mr. Darphins widow’s interests. I find it highly doubtful that a woman in her eighties would be concerned on her own accord by a perceived breach of contract. If she is worried that any agreement made with her husband 25 years ago would cause her considerable financial loss that is because Mr. Levy must have sold her porkies as he has done previously (see below). This is not the first time that Mr. Levy has played this hand. In 2009 we placed our first advertisement with the HRCA magazine for a Darstaed product, Mr. Chris Graebe was the editor at the time. Mr Graebe contacted me and informed me that he had received a letter from Mr. Levy in which Mr. Levy said that he represented the legal interests of Mr. Darphin who was very upset with us advertising British trains under the name Darstaed as the name Darstaed only could be used for making replicas of the 40 cm Märklin coaches. In addition to that Mr. Levy insisted that he had been instructed to check in advance any advert that we wished to place. In reply I sent to Mr. Graebe the agreement above and, needless to say, the matter was resolved instantly. Mr Graebe forwarded the agreement to Mr. Levy and sent him packing. Noting that his attempt to mislead the HRCA came to naught Mr. Levy blamed Mr. Darphin (about 90 years old at that time) to have given him the wrong information. Who will Mr. Levy blame this time for his mischief ? 2. The next untruth in Mr. Levy’s statement is that the sale of the TM was for the range of 40 cm tinplate coaches only. From the HRCA episode described above he knows very well his statement is not true. It is clear from the agreement that Mr. Darphin sold his company and TM with all its rights, lock, stock and barrel to me (i.e. my Hong Kong company) without any reservation. There is absolutely no limitation to our use of the Darstaed TM, we are since 2013 also producing Darstaed N Scale and if tomorrow we like to produce Darstaed Gauge 1 we are fully entitled to do so. 3. Mr. Levy’s mention about the restriction regarding typeset I find amusing, how on earth did he dream up that one ? Fantastic ! The indication “TP” I emulated from Mr. Darphin’s description of that product line and the artwork (included in the sale). It is printed on the boxes containing the 40 cm coaches so I decided to leave the artwork intact which pleased Mr. Darphin. “TP” refers to a product type and not to a limitation of the TM “DARSTAED” which is made clear in section 1a) of the agreement where no limitation of the use of the name Darstaed is mentioned at all. 4. Mr. Levy claims to be a great model railway historian and of course you have to be knowledgeable if you sell books that are printed and written by others. An editor has to check that everything is correct. It is therefore astonishing that such a knowledgeable man is of the opinion that in 1966 Darstaed finescale was produced before Darstaed tinplate. One of the first invoices from Darstaed is to Märklin GMBH for a number of die cast bogie sides made by Teufenthal. The manufacturing of the 40 cm Märklin replicas was a commercial enterprise. Only much later Mr. Darphin made some finescale rolling stock on a very small scale basically as he needed it for his own very famous finescale layout and little was available commercially in the 1980’s. These finescale models were hand made.on a small kit building scale. Mr Darphin requested if I would allow him to continue to make these fs items under the name Darstaed and I granted him this courtesy for as long as he lived. This was a gentlemen’s agreement not included in the agreement although the request was hand written by him on a draft agreement. Obviously there was mutual trust. 5. Darstaed was founded in 1966 and I cannot find anywhere in the agreement that this is not the case. We are proud to continue the tradition set by Mr. Darphin and Twerenbold over 50 years ago and would there not have been Darstaed there would not have been ACE Trains either as the genesis of ACE Trains was the manufacture of a replica of the Hornby 4-4-4 in electric, a project initiated by the Darstaed agent in Britain Mr. Ron Budd, a well known collector and respected founding member of the HRCA. Mr Levy came on board much later in the role of distributor. (See St. Mawes agreement). 6. Regarding Mr. Levy’s suggestion “mislead” I leave it to the reader to judge who has been and is misleading who. Is Mr. Levy’s statement libelous ? 1. A published false statement that is damaging to a person's reputation. 2. A false and typically malicious statement about a person. 7. Regarding the Court Order Mr. Levy should rephrase it. I am in contempt of Mr. Levy, not the Court. The Court and its decisions I respect. However this is a matter between Mr. Levy and myself that is of no one else’s concern and will be resolved in due course after Mr. Levy ceases to cause mischief. You cannot expect someone to pay while doing everything to smear his reputation or try to run his business into the ground. The amount mentioned is grossly exaggerated. 2010 - ACE Trains is a registered trademark jointly owned by the ACE Electric Trains Company and Mr Andries Grabowsky.